Do not eat any fungi that has not been properly identified by a qualified professional, some are DEADLY when ingested. All edible wild fungi MUST be cooked. 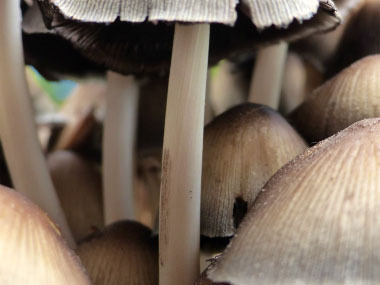 Overview: Mica caps, also known as the glistening ink cap are saprobic and they harness their energy by decomposing wood. They tend to favour stumps, logs, and buried wood. Most of the time, the mushrooms grow on wood or right next to wood. Sometimes they are at the bases of trees, even when the trees seem healthy. The Mica Cap is not very picky about the type of wood it decomposes, which is unusual in the mushroom world. 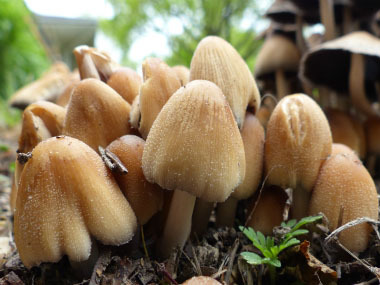 Although it evolved to live in forests, mica caps do well in urban landscapes and is a common sight in gardens and cultivated areas. 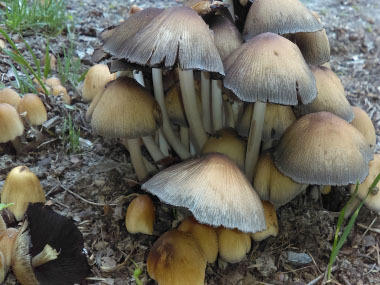 Distinguishing Features: Mica caps are one of the rare inky caps that are easy to identify. These medium-sized mushrooms appear in dense clusters on dead wood and feature brown caps coated with a distinctive dusting of salt-like or mica-like granules. The unique combination of size, habitat, and salt-like granules makes mica caps instantly recognizable. Caps are reddish-brown to tawny to ochre-brown, becoming grayish particularly near the margin. The surface is covered by listening granules that are soon lost. The cap is radially lined almost to the centre. 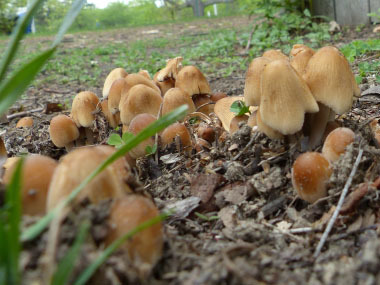 The mushrooms grow larger than many inky caps, cap size reaches sizes of 2 to 6cm wide. Height: The stem measures anywhere from 2 to 8 cm long. It is 3 to 6 mm thick; smooth to very finely hairy or granulated; white; fibrous; and hollow. 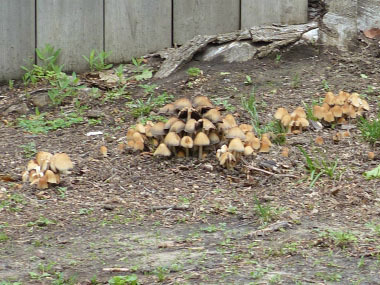 Habitat: Mica caps are widespread and common. They fruit in large numbers on or near stumps, often in grass from buried wood. This mushroom is found across North America and Europe but also grows in more limited areas of South America, Asia, and Australia. Spore print: Black spore print. Season: You can find this mushroom in spring, summer, and fall and occasionally in winter (in milder climates). Typically it is one of the first gilled mushrooms to appear after the end of winter. 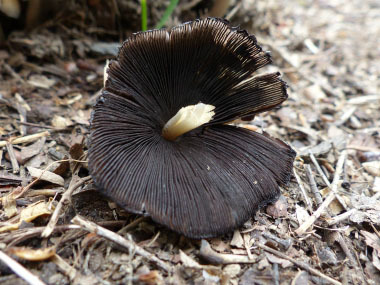 Gills: Attached to the stem or free from it; when young, gills are pale, becoming brown, then black; deliquescing (turning to black "ink") but usually not completely. Gills grow close together or crowded. 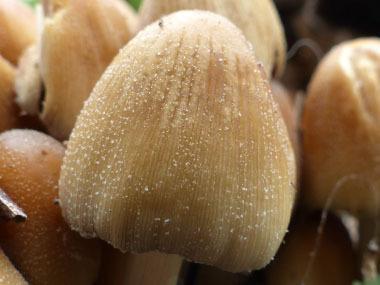 Edibility: The Mica Cap is considered an edible mushroom, although it does not have much flavour. You should collect only specimens that have not yet begun to liquefy. Mica caps must be cooked and eaten almost immediately after collecting as they will begin to deliquesce or dissolve into an inky black spore filled liquid within 1 to 3 hours. Cooking halts the process of auto-digestion (enzymatic process). High in potassium.